Continental Shelf Depth of 200m or the Limit of Exploitation. Complete search and rescue capability around Africa's coast was secured March 3 2011,when representatives from Cape Verde, Gambia, Guinea Bissau, Mauritania, Morocco, and Senegal signed a multilateral agreement on a North and West African sub-regional Maritime Rescue Coordination Centre, the International Maritime Organization announced. The agreement sets up a new MRCC near Rabat in Morocco. Coastline: Sandy beaches and rocks. Tides. 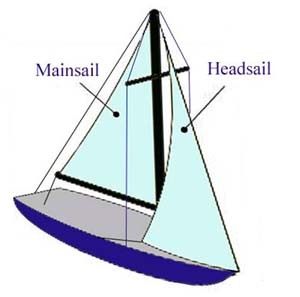 Trade winds. Three saints, Moulay Bou Zerktoun, Sidi Haraz (Cap Sim) and Sidi Mogdoul are the most important marabouts and they are protectors of the sailors. Essaouira is called the "Wind City" because of its persistent north wind sometimes violent mostly in the summers and during the days. which offer excellent wave conditions, 1-3 m. Winter is best for surfing. 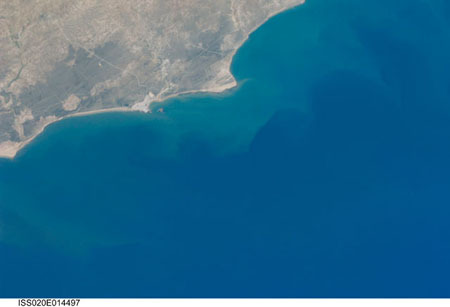 "In this image we can see the sets of swell arriving from the top-left of the picture (northwest). We can then see the distinct and different patterns that are formed as these swells interact with Mogador island off the coast of Essaouira. 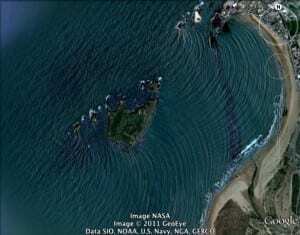 The swell diffracts through the gaps either side of the island and then these two patterns meet again in a thin line that runs from the top of the island to the land just above the large breaking wave." Mogador is an ancient Phoenician site on the west coast of Morocco, and is the most remote permanent settlement known with respect to the homeland in Tyre. Established in the 6th century BC according to A. Jodin, the original excavator on the island, the site falls within customary parameters for Phoenician site selection, lying near the outlet of a coastal estuary with a good natural harbour, and having good access to stone building material. Prior to arrival of the Phoenicians in this coastal area of Morocco, the indigenous peoples were generally interior peoples known even today as Berber tribes; these nomads lived simply as early as 4000 BC and left little architectural trace; they were called ‘'Maures'‘ by the Romans leading to the region's early Roman name of Mauretania. 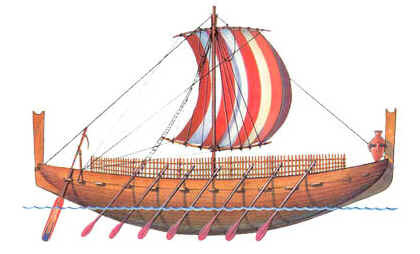 A Greek translation of a Punic (Carthaginian) inscription states that Hanno, a Carthaginian, was sent forth about 500 BC with 60 ships and 30,000 colonists to found cities. Even allowing for a possible great exaggeration of numbers, this expedition, if it occurred, can hardly have been the first exploratory voyage along the coast of West Africa. Hanno founded Thymiaterion (now Kenitra, Morocco.) and built a temple at Soloeis (Cape Cantin, now Cape Meddouza). He then founded five additional cities in and around present Morocco, including Carian Fortress (Karikon Teichos) and Acra (Agadir). The Carian Fortress (Karikon Teichos) is perhaps to be identified with Essaouira on the Moroccan coast, where archaeological remains of Punic settlers have been found. 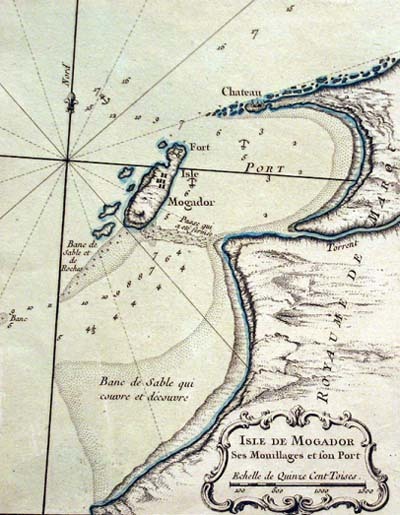 See: Origin of the name Mogador. Hanno evidently reached the coast of present Gambia or of Sierra Leone and may have ventured as far as Cameroon. There is no record that Hanno's voyage was followed up before the era of Henry the Navigator, a Portuguese prince of the 15th century. "Cañas fecit in Mogodore, anno 1767."